Using a bra for your vehicle is one of the quickest, easiest ways to dress up your car and preserve the paint job. 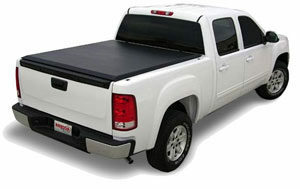 Similarly, a tonneau cover can protect your truck bed from inclement weather. As soon as you invest in either a car bra or a tonneau cover, our advice is to start using a protectant to keep it looking good. Sure, the point of a car bra is to keep the hood in good condition. But that doesn’t mean you want a cover smeared with bugs and road debris every time you hit the highway. So, how do you keep your car’s bra or truck’s tonneau cover as shiny and attractive as the car itself? A quick spray on both invisible masks and vinyl covers will leave a shiny, glossy appearance and keep grime and soil at bay. If your car bra is vinyl, be careful about which product you use. The chemicals in some can cause condensation and damage the paint underneath. Whether you use 303’s Automotive Protectant or another high-quality protectant to protect your tonneau cover, be sure it’s free of silicone oils and other ingredients that could affect the product’s breathability and harm the vinyl. While our car care advice is usually focused on money-saving tips, this is one area where we suggest investing. Selecting the pricier vehicle cover often means you’re getting a carefully manufactured, properly designed product that will fit your car better, last longer and be easier to remove and reinstall. This, combined with proper care and protection, will help to preserve your car and your car bra or tonneau for years to come. Do you plan to use this method on your cover? We’d love to see a photo! Comment below!